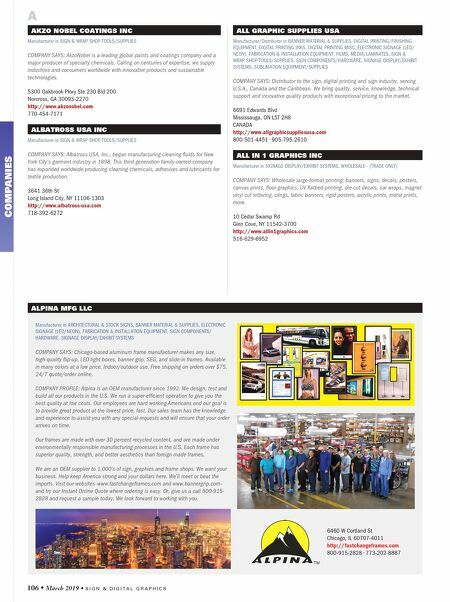 S I G N & D I G I T A L G R A P H I C S • March 2019 • 107 ALLPRINTHEADS.COM Distributor in DIGITAL PRINTING INKS, SUBLIMATION EQUIPMENT/SUPPLIES COMPANY SAYS: www.allprintheads.com concept born from an idea to bring to market a comprehensive list of essential spare parts and accessories to make any wide-format printing operation run smoothly and efficiently. We sell spares parts, consumables and much more. 8583 Irvine Center Dr Ste 388 Irvine, CA 92618-4298 http://www.allprintheads.com 800-616-0584 • 949-614-0637 ALMO PROFESSIONAL AV Distributor in ELECTRONIC DIGITAL SIGNAGE, SOFTWARE COMPANY SAYS: We are the nation's most advanced commercial audio-visual distributor serving the needs of professional integrators, re-sellers and consultants. Our partners receive the full distribution experience on a personal level. 1447 York Rd Ste 700 Lutherville, MD 21093-6099 http://www.almoproav.com 888-420-2566 ALL SQUARE DIGITAL SOLUTIONS Distributor in DIGITAL PRINTING/FINISHING EQUIPMENT, DIGITAL PRINTING INKS, MEDIA/ LAMINATES, SOFTWARE COMPANY SAYS: Founded in 1998, All Square Digital Solutions is an authorized professional re-seller and leading distributor of wide-format inkjet printing equipment, software, supplies and consumables for the digital printing industry. 4607 Dairy Dr Greenville, SC 29607-3792 http://www.allsquare.com 888-286-8801 • 864-272-2150 ALLIANCE TECHNOLOGY CORP Manufacturer in DIGITAL PRINTING/FINISHING EQUIPMENT COMPANY SAYS: Alliance Technology Corporation (ATC) manufactures wide-format hybrid and RTR UV liquid coating systems for safe and cost effective protection of digitally printed materials. ATC offers a variety of UV liquid coatings for indoor/ outdoor protection. 2 N Maple Ave Ridgely, MD 21660 http://www.atc-cyclone.com 410-634-9381 A Simple. Reliable. Saves You Money! $ The StarLam 1600R Roll-to-Roll Laminator features easy operation and delivers a smooth, consistent coating on a wide variety of substrates. • Versatile - Coats substrates up to 64" wide • Reliable - Applies a smooth, consistent coating • Easy - Designed for single operator use • Profitable - Same protection as film at a fraction of the cost! Contact us today! 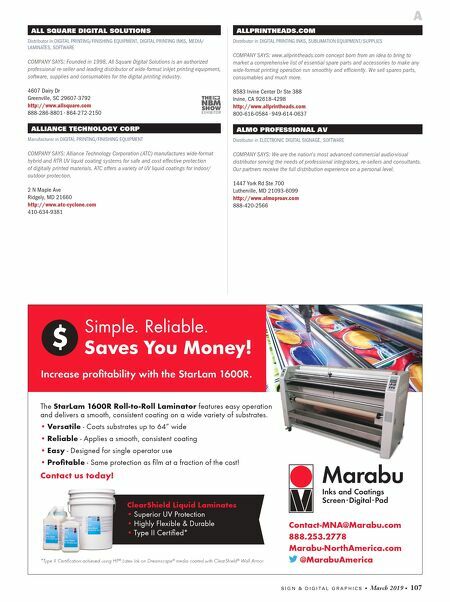 Contact-MNA@Marabu.com 888.253.2778 Marabu-NorthAmerica.com @MarabuAmerica Increase profitability with the StarLam 1600R. ClearShield Liquid Laminates • Superior UV Protection • Highly Flexible & Durable • Type II Certified* *Type II Certification achieved using HP ® Latex Ink on Dreamscape ® media coated with ClearShield ® Wall Armor.